Oh Three Oh Four: Lynnderella G. Whizard, Esq., Ground Control to Major Sloth, Happy Birthstar! & Oh Mickey! You're So Fine! Lynnderella G. Whizard, Esq., Ground Control to Major Sloth, Happy Birthstar! & Oh Mickey! You're So Fine! G. Whizard, Esq. 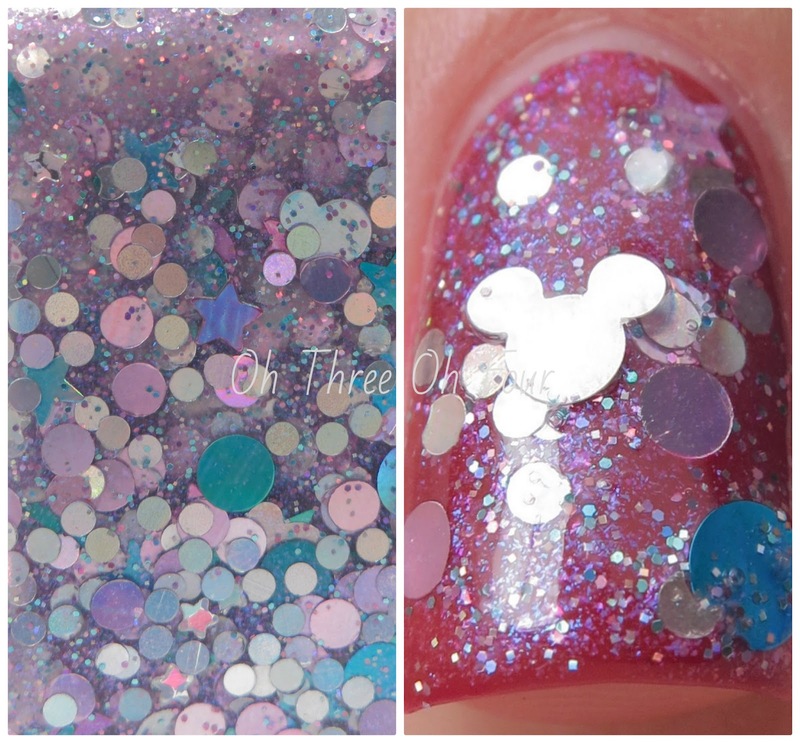 has a clear base and is packed with blue holographic micro glitter. All nails are 2 coats with top coat. Ground Control to Major Sloth contains royal blue squares and hexes, baby stars, neon blue and purple hexes, and a dash of star glitters in various colors all in a shimmery blue-purple base Here is 2 coats of Ground Control to Major Sloth over 2 coats of Avon Aurora. Happy Birthstar! has a pink-blue shimmery base with pink and silver dots, micro neon purple glitters, baby stars and other star glitters in shades from red to pink. For this mani I used 3 coats of Sally Girl Luv It and 1 coat of Happy Birthstar! Oh Mickey! You're So Fine! is made with holographic dots, stars and Mickey-shaped holographic glitter in a potent (not mousey) lavender-shimmered base. Shown is 2 coats over 2 coats of China Glaze Red Satin. 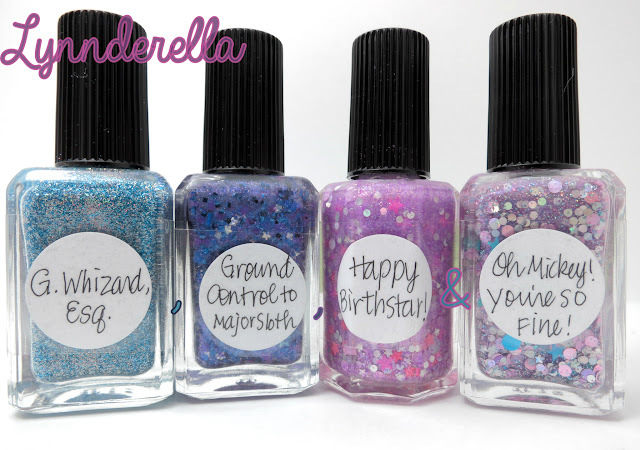 Purchase Lynnderella polishes through Lynnderella.com. I'm not 100% if G. Whizard, Esq. or Happy Birthstar! will be for sale, though I do know Ground Control to Major Sloth will be sold under a different name (and sans the awesome slothstronaut :P ). You can also find Lynnderella Lacquers for sale through Norway Nails and Glitter Connect. Be sure to follow all the Lynnderella fan pages on Facebook, Twitter, Instagram, Pinterest and Tumblr.